Image Size 15 x 15 in. Jamelie Hassan is an award-winning visual artist based in London, Ontario. A survey exhibition, “Jamelie Hassan: At the Far Edge of Words” was organized by Museum London curated by Melanie Townsend in 2009 and the Morris & Helen Belkin Art Gallery, the University of British Columbia, Vancouver, curated by Scott Watson, in 2010 and toured in Canada through to 2013. Her works are in major public collections including the National Gallery of Canada, Ottawa, the Art Gallery of Ontario, Toronto, Museum London, London, Ontario, Western University, London, ON, the Morris & Helen Belkin Art Gallery, the University of British Columbia, Vancouver, British Columbia and the New Museum, New York, NY. Her installation works involve highly diverse sites including ” Nur” installed in the library of the Great Mosque of Xi’an, China and Weldon Library at Western University, the Ottawa Courthouse and Land Registry and the London Regional Cancer Clinic. In 2001 she was awarded the Governor General’s Award in Visual and Media Arts, the Chalmers Art Fellowship in 2006 and the Canada Council for the Arts international residency program in Paris, France in 2012. She was a recipient of the “Canada 125” Medal for outstanding community service in 1993. She received an honorary doctorate in visual arts from OCAD University, Toronto in June 2018. 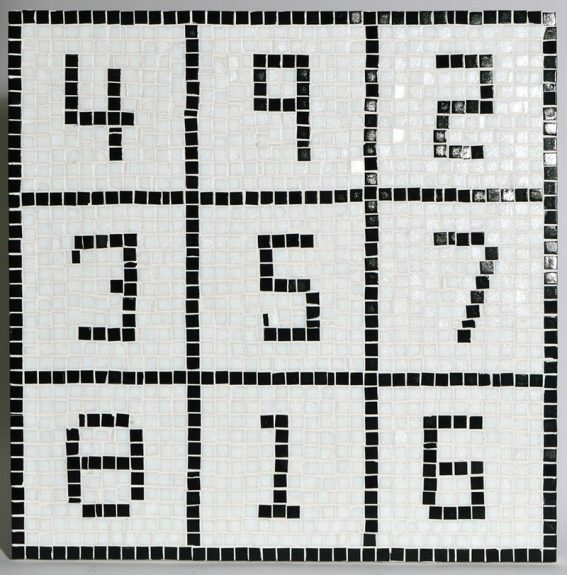 A magic square is a square which is divided into smaller squares, each containing a number, such that the numeric figures in each vertical, horizontal and diagonal row adds up to the same value. The number 5 is typically placed in the centre of the square. The magic square has a rich history and has been found in many cultures within mathematical, alchemical and medicinal contexts. As well the magic square often functioned as a protective talisman – for example the 3×3 magic square was used as a charm to ease the pain of childbirth (Jabir ibn Hayyam, 9th c). In another context, a magic square, presently in the collection of the Xi’an National Museum, was found beneath the cornerstones of a building. This artifact was buried in its foundations to ward off evil spirits and was excavated from the site of a palace in the eastern suburb of the city of Xi’an, China (1275).